When I was in university I had to stop playing guitar for a year or so because of tendonitis in my left hand. When I was getting back to playing guitar, I was advised to play very little at first: 5 minutes a day for a while, then 10 minutes a day for a while, and so on. The idea was to slowly build up my endurance for playing. It was really frustrating to play for such a short time. And, I found it hard to think of what would be worthwhile to practice for such a short time. I wanted to do something reasonably easy on the hands. Nothing too strenuous. But, also something that would help my playing generally in the future. Why scales? Because THAT is where the melodies live! My guitar teacher, Steve Fisk, showed me a way to practice scales which is really fascinating and musical. Today, I’d like to show it to you on the uke! This is good practice! But, many songs have leaps in the melody. We don’t always go to the next note in the scale. Sometimes we jump to a note. We leap! Can you imagine how boring music would be if the melody wasn’t allowed to leap? My teacher Steve introduced me to the idea of practicing scales in THIRDS. Let me explain. A “third” is a way of describing the relationship between two notes. 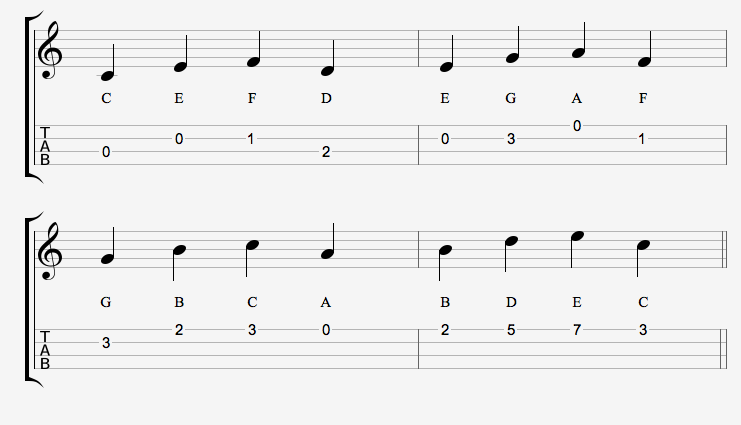 For example, in the C scale above, the C note and E note are “a THIRD apart.” Also, the D note and F note are a third apart. And the E and G, etc. Can you hear how musical the scale becomes this way? Also, it takes a lot longer to get through the scale. It extends the melodic material! Great for improvising! And for practicing picking melodies. After showing me how to play scales in thirds, Steve showed me how to play scales in “alternating thirds”. This had an even cooler sound to it. Let me give you an example. When we play in alternating thirds, we alternate the direction in which we play the pairs. The first pair we play from low to high like usual: C then E. But, the second pair we start on the high note and then play the low note: F then D. Then, we start on the low note in the next pair and play E then G. Then we start on the high note of the next pair and play A then F. And so on. Here’s an example using the C scale again. Once you play and hear it, the musical logic will emerge. I think this sounds really cool. Even more musical than the scale in straight thirds! Steve went on to show me how to play a scale in fourths, fifths, sixths and sevenths, in a similar fashion. Really cool. That’s all I practiced when I was limiting myself to playing 5-10 minutes a day. And you know what? I really enjoyed it! Okay, here is a video where I talk through today’s lesson and go a little deeper into playing scales in thirds, as well as fourths. I have also made up a little practice sheet for you to work with along with the video. 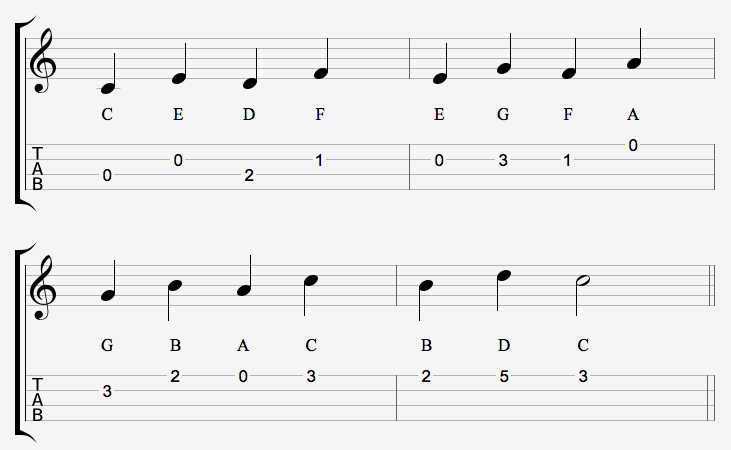 Once you get the idea of playing scales with leaps, you can apply it to any scale that you know. Try practicing scales this way for 5-10 minutes a day. It may just supercharge your picking. Maybe try a little improvising too. Enjoy it!